Thisrundown of major mission events for NASA?s Phoenix Mars Lander is a detailedevents schedule for the spacecraft?s planned landing in the Martian arctic onMay 25, 2008. Suppliedby NASA, the schedule below includes a minute-by-minute account of theanticipated steps the spacecraft must take beforetouching down on the surface of Mars. ThestationaryPhoenix lander launched in August 2007 on a $420 million mission to the VastitasBorealis region of Mars, where the probe is expected to dig for Martian ice anddetermine if the area could have once supported microbial life. Unlessotherwise noted, the location for news briefings and commentary are NASA's JetPropulsion Laboratory, Pasadena, Calif., andwill be broadcast live on NASA TV. -- Newsbriefing, 11:30 a.m. to 12:30 p.m. NOTE: The times below for the Phoenix spacecraft events on May 25 arefor a nominal scenario. Remaining navigational adjustments before May 25 couldshift the times by up to about half a minute. In addition, the times for someevents relative to others could vary by several seconds due to variations inthe Martian atmosphere and other factors. For some events, a "give ortake" range of times is given, covering 99 percent of possible scenariosfrom the atmospheric entry time. For events at Mars, times are listed in"Earth-receive time" (ERT) rather than "spacecraft eventtime" (SCET). This means the listed time incorporates the intervalnecessary for radio signals traveling at the speed of light to reach Earth fromMars. On landing day, May 25, the two planets are 171 million miles apart (275million kilometers), which means it takes the signal 15 minutes and 20 secondsto reach Earth. For some spacecraft events, engineers will not receiveimmediate radio confirmation. -- Trajectorycorrection maneuver opportunity (TCM6X), 8:46 a.m.
-- Begin"bent-pipe" relay (continuous transmission of Phoenix data as itis received) through NASA's Mars Odyssey spacecraft to Goldstone, Calif., DeepSpace Network station, 4:38 p.m.
-- Green Bank, W. Va., radio telescope listening for direct UHF from Phoenix,4:38 p.m.
-- Spacecraftenters atmosphere, 4:46:33 p.m.
-- Likely blackout period as hot plasma surrounds spacecraft, 4:47 through 4:49p.m. -- Legs deploy, 4:50:40 p.m., plus or minus about 13 seconds. -- Lander separates from backshell, 4:53:09 p.m., plus or minus about 46seconds. -- Constant-velocity phase starts, 4:53:34 p.m., plus or minus about 46seconds. -- Begin NASA's Mars Reconnaissance Orbiter playback of Phoenix transmissionsrecorded during entry, descent and landing, 5:28 p.m. However, data foranalysis will not be ready until several hours later. -- Begin Europe's Mars Express spacecraft playback of Phoenix transmissionsrecorded during entry, descent and landing, 5:30 p.m. However, data for analysiswill not be ready until several hours later. -- Mars Odyssey "bent-pipe" relay of transmission from Phoenix, withengineering data and possibly including first images, 6:43 to 7:02 p.m. Datacould take up to about 30 additional minutes in pipeline before beingaccessible. If all goes well, live television feed from control room may showfirst images as they are received. The first images to be taken after landingwill be of solar arrays, to check deployment status. 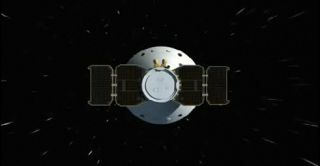 Dailynews briefings at 11 a.m.
-- If operations proceed relatively smoothly, the first eight to 10 days afterlanding will be a "characterization phase" of checking out andunderstanding the performance of the spacecraft's power and thermal systems, aswell as the robotic arm and other instruments. -- At the end of the characterization phase (date TBA), the first sample ofsurface soil will be delivered to the Thermal and Evolved-Gas Analyzer onboardPhoenix. -- Analysis of soil from the surface in both the Thermal and Evolved-GasAnalyzer and in the Microscopy, Electrochemistry and Conductivity Analyzer willlikely take 10 to 15 days if all processes go well. After that, each additionalsampling cycle will reach a deeper subsurface level, in increments of about twoto three centimeters. At each different layer, collecting and analyzing samplesis expected to take 10 to 15 days, barring operational difficulties. -- How soon the digging reaches the expected icy layer will depend on how farbelow the surface that layer lies. Estimates in advance of landing range fromtwo to five centimeters. If the ice is at the deeper end of that range, thefirst analysis of an icy sample could be in July or later.